How can India’s rural poor deal with ‘wild water’? And then life becomes even more difficult for Sheela, a 35-year-old mother of five children, who has been living in Kubri village for almost 20 years. “I spend half of my day in fetching water as a minimum of 12-13 rounds are required for this big a family. Each round takes around 20 minutes. Sometimes we have to wait because of the queue as there are only few working handpumps in the village,” she explains. Sheela’s body aches because of carrying this heavy weight every single day. As a result she has started sending her 12-year-old daughter Kanchan to get water. Her daughter does three rounds in the morning but because of that she is often late for school. “Even after all this my kids keep on falling sick as I can’t clean them for days due to water shortage,” adds Sheela. One of the greatest crisis that humankind is expected to face in the 21st century is inadequate availability of clean water for everyone, everywhere, which can be exacerbated by extreme weather events and climate change. India is particularly vulnerable with the World Bank estimating that most parts of the country will experience increasingly extreme weather events like unpredictable monsoons, prolonged drought and falling groundwater tables. There is evidence that this is already happening. There has been a decline in monsoon rainfall since the 1950s and the frequency of heavy rainfall events has increased. This has a direct link to groundwater levels with increasing withdrawals occurring due to erratic monsoons and inconsistent water availability. The rate of groundwater extraction in India has increased tenfold since the 1950s and 54% of the country now faces high to extremely high water stress. There is some change happening. The state government of Sikkim has been investing in reviving mountain springs, on which mountain communities are dependent, across the state using a mix of traditional and scientific watershed management tools. 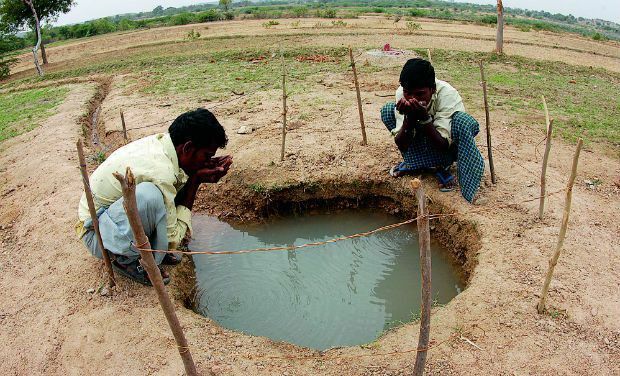 The state government of Telangana has launched an ambitious programme to help restore and revive village level water storage and replenishment structures. This needs to spread to more states across India. It is only then that someone like Sheela, instead of descending deeper into back-breaking poverty, will be able to focus on the well-being and education of her children and enable a brighter future for them.